COACH SCOTT FROST RESCHEDULED. 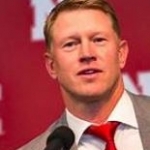 As hoped, we have been able to reschedule University of Nebraska Football Coach Scott Frost to speak to Chamber business representatives. He will be in Grand Island on Tuesday, April 23 at 4 p.m. at Riverside Golf Club, to provide an update on Nebraska football and the role leadership plays in changing the culture of an organization. league! RSVP with your confirmed attendees no later than April 16 to clierman@gichamber.com or 382-9210.